It started raining yesterday lunchtime and it’s still going strong. Which means my newly arranged dog training night is rained off and will now, hopefully, commence next week. L has to defer her daily 5k run as well, probably until tomorrow and is apocalyptic about her failure to go out in the deluge. She suggests that Mo and Usain wouldn’t skipped their 5k because of the rain. Actually, I bet they would. They’ve had gone and done it at some indoor facility with a 400m track. The council haven’t built ours yet. 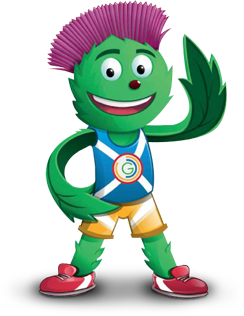 Meet Clyde, a ‘sport-loving thistle full of cheeky Glaswegian charm’, apparently. The official mascot of Glasgow 2014. The rain actually stops around 4pm. So when I get home, the ‘boys’ get to go on the park instead. Although it has to be quick one, as the council are locking the gate earlier and earlier due to the darker evenings. Doggo overdoes it and returns with a limp again. Then we collect L from Derby, where’s she’s been to see some strip show, ‘Calendar Girls’ stage version.